We are often asked if the EverEdge powder coating will be damaged by whipper snipping. The answer – NOT AT ALL! We have conducted extensive tests including holding the whipper sniper against a piece of EverEdge until the nylon cutting thread was completely worn out and there still wasn’t a mark on the length of EverEdge. Because the powder coating is baked on at such a high temperature (200 degrees) it is incredibly resilient and can easily withstand being hit by the nylon cutter of a whipper snipper. I must quickly add that it will, however, be marked by a whipper snipper with either a wire or other metal cutter. 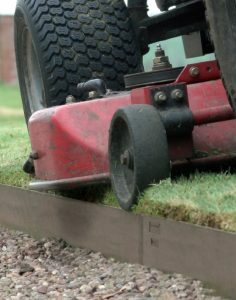 We do generally recommend that EverEdge is installed with the top of the edging at the bottom of the blade of grass (so where the lawn meets either a garden bed or path the lawn is higher). 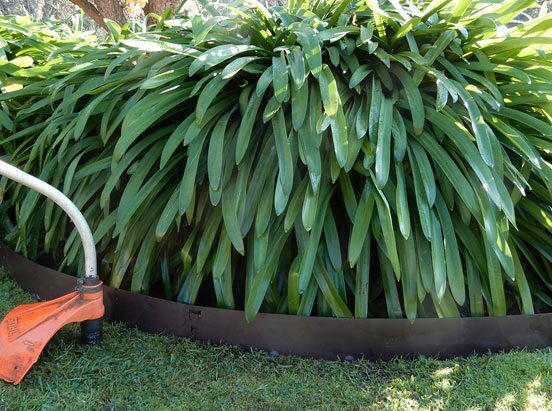 This means that the edge can be mown over and there is no need for whipper snipping. However, in some cases this is not possible and the whipper snipper does do a great job of keeping a neat lawn right up to the edge. So keep going! You won’t damage your EverEdge at all.